To provide a better understanding of some of the issues in the selection, use and testing of our cleanroom consumables, Texwipe has developed a number of Technical Notes, aka TechNotes. Topics include wiper consistency, cleaning of isolators, sterility validation, cleanbuild protocols, particle testing and cleanroom stationery. 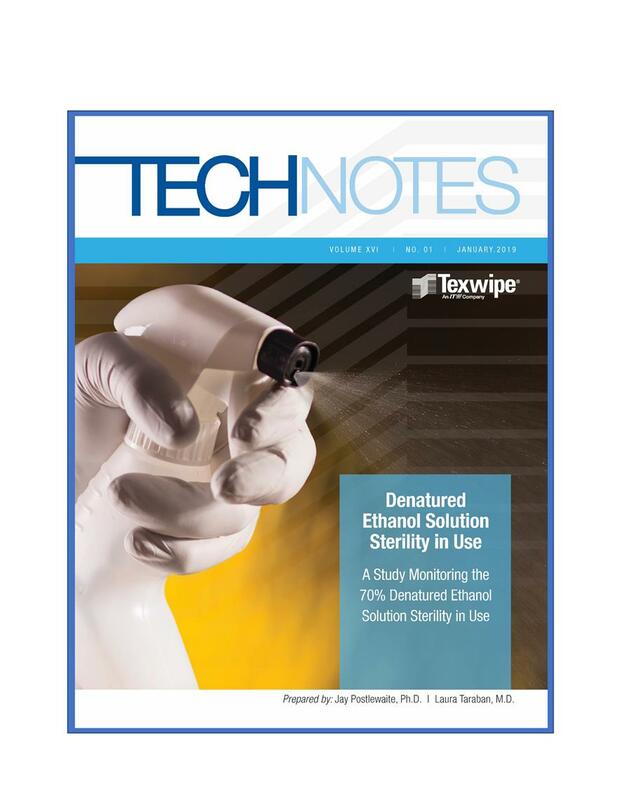 Much additional information on specialized topics in contamination control can be found in the Published Papers section of the Texwipe Library. We welcome feedback on these Technical Notes. If you have comments or questions, or feel that there are other topics that you would like to see developed as Technical Notes or publications, please contact us with any questions or feedback. An observational study of using TexQ® Disinfectant Cleaning Protocol in Removing Hazardous Drug Contamination During Sterile Compounding. A Texwipe developed protocol which includes TexQ, a disinfectant and cleaner, and wipers pre-wetted with 70% USP-grade IPA solution for the decontamination of surfaces exposed to hazardous drugs. The efficacy of the protocol was assesed at Bureau Veritas North America (BVNA), an independent testing organization internationally recognized as a leader in testing, inspection and certification. Integrity Test Results for Bags Used as a Component of Sterile 70% IPA, TexQ Disinfectant and TexP peroxide solutions. A study showing the corrosiveness of TexTab™ TX6460 and sodium hypochlorite solutions on the stainless steel and aluminum samples. TexTab™ Solution Decay Study A study that determined the effect of storage on a diluted TexTab™ TX6460 solution. A study monitoring in-use 70% Isopropyl Alcohol Level using a specific gravity method test. Integrity Test Results for Bags Used as a Component of Sterile 70% IPS, TexQ Disinfectant and TexP peroxide Solutions. A study monitoring the in-use 70% ethanol percentage in a denatured alcohol solution. Conclusion: Texwipe's 70% Denatured Ethanol solution may be used for at least 28 days without concern for the percent ethanol concentration changing. A study monitoring the sterility of Denatured Ethanol solution in use. Conclusion: Texwipe 70% Denatured Ethanol solutions may be used for at least 30 days without concern for thier sterility change. A study to monitor the hydrogen peroxide concentration over a period of time at an elevated temperature of 50°C to simulate storage at room temperature for three years. Microdenier wipers are increasingly gaining acceptance for use in cleanroom environments because of their ability to perform well in critical cleaning applications. Wipers are used to control contamination in cleanroom environments in a variety of industries, from building the next-generation microchip to manufacturing the newest vaccine. Each of these settings may have different applications for a cleanroom wiper, but measuring the wiper quality should always be the same, i.e. consistent. Swabbing is the preferred method to validate critical cleaning within pharmaceutical manufacturing environments. As a result, the selection of a quality swab and a validated swabbing method is critical to producing sensitive, accurate, and repeatable results.